With a bevy of design fairs taking place in New York this week, it was impossible to venture far in the city without stumbling across an exhibition of new design. From Wanted to ICFF, we criss-crossed the island to cover it all. Saturday, we pounded the pavement in NoHo to scope out the goods on view as part of the 4-day Noho Design District show curated by Monica Khemsurov and Jill Singer of Sight Unseen. The hip downtown neighborhood is a design destination, luring tourists and natives alike interested in getting a sneak peek of what’s to come from young designers. Click through for a look at some of our NDD picks. Environment launched the Cleat Series by design studio Commune (you may have spied their handiwork at the Ace Hotel and Swim Club in Palm Springs). 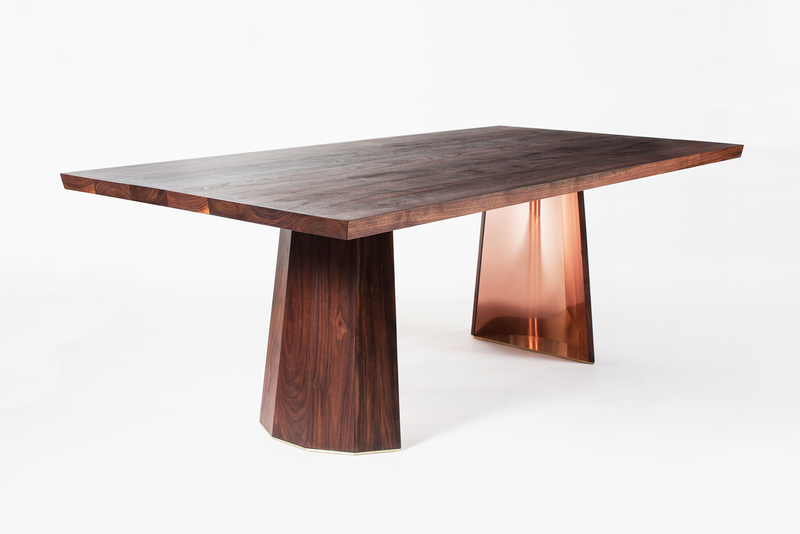 The studio’s first collection is full of brass-tinged beauties, but the dining table is what really caught our eye. The window at The Future Perfect was filled with a special installation of a slew of Bec Brittain’s new Axial Light, seen here. Inside at The Future Perfect, an installation celebrated the last 10 years of design by Heath Ceramics. Photo by Jeffery Cross. Inventory magazine’s recently opened location showcased their Kyle Garner designed interiors. Also on display, Garner’s Sling Chair—a glimpse of what’s to come from his newly launched Sit and Read furniture line. Chen Chen + Kai Williams shared the process behind their new fruit planters in a master class at the Bowery Hotel hosted by Sight Unseen. Attendees cast molds of their own and left with the next best thing to a Chen and Kai original—one they’d made themselves. Bare Bones, a reinvented set of concrete dominoes by The Principals, were put to use during a Domino Tournament at Billy Reid on Saturday. Andrew O. Hughes hand-blown glass mixing bowls stood out in the cellar kitchen of the American Merchant Museum. The museum (an intact 19th century home) provided a historical backdrop for modern pieces from designers including Hughes, Meg Callahan and Fort Makers. Sight Unseen chose 12 up and coming designers to exhibit their work at Noho Next, a showcase of emerging American talent. The milky glass on the South Side of the Sky chandelier seen here is hand-blown by John Hogan of Seattle’s Professional Associates. Also at Noho Next, Ladies and Gentleman’s Maru lighting, pendant lights created from beaded parts. A pair of rod and weave chairs from Portland-based Eric Trine round out our Noho Next picks. New cast-brass bottle openers from Brooklyn duo Fort Standard were used to crack open the cold ones at the Noho Design District’s opening night party at The Bowery Hotel. Vitsoe teamed up with subterranean neighbors Dashwood Books to host the 620 Reading Room in celebration of the re-engineered Dieter Rams’s classic 620 Chair Programme. The modular chair system was launched by Vitsoe in the early 1960’s and has been updated with a coconut husk and rubber filling. Louie Rigano’s Glittering Urn explores the theme of Trophy for the American Design Club’s juried exhibition at the Standard East. New lighting from Lindsey Adelman—the Spike Chandelier—calls for some bubbly! The public can stop by her showroom through Tuesday to check out the lighting in person while sipping champagne.